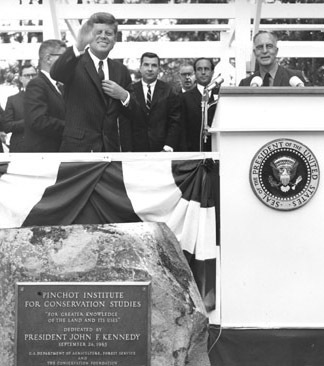 Pinchot Institute dedication, September 24, 1963. After Gifford Pinchot’s death in 1946, Grey Towers remained a hub of conservation activity. Cornelia Pinchot maintained an interest in conservation until her death in 1960, serving as a delegate to the United Nations Scientific Conference on Conservation and Utilization of Resources in 1949 among many other activities. In 1963, their son Gifford Bryce Pinchot turned over the house and 102 acres to the federal government so as to assure the conservation legacy of his father. President John F. Kennedy visited Grey Towers in September 1963 to dedicate the site and the Pinchot Institute for Conservation. The U.S. Forest Service operates the national historic site, which has nearly 25,000 visitors a year. Forest Service staff oversees a variety of activities on the grounds: public tours of the house and grounds; conference facilities for natural resource groups; research opportunities for visiting scholars; on-site programs including environmental education programs and chamber music concerts; and other recreational activities such as short hiking trails. The Forest Service works in partnership with the Pinchot Institute to offer conservation education and environmental literacy programs for students of all ages at Grey Towers. A program developed for teachers provides training and materials to support environmental literacy and conservation education in school classrooms around the country. 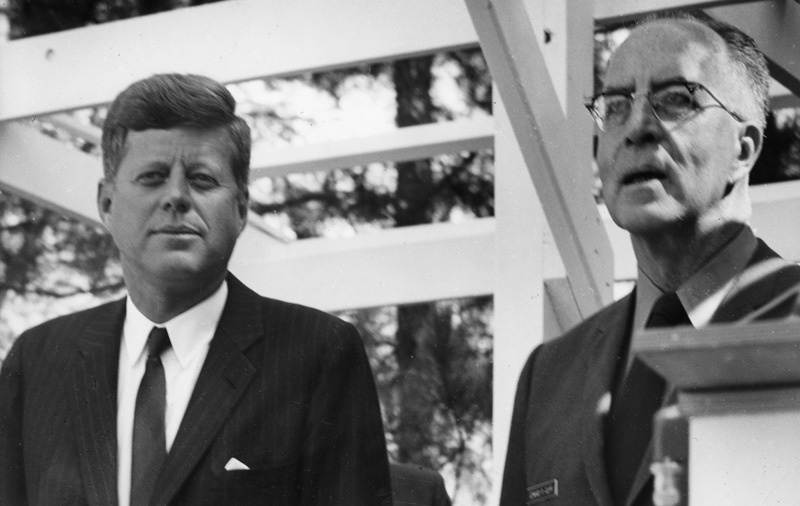 President John F. Kennedy and Chief of the U.S. Forest Service Edward P. Cliff. In addition to working with Grey Towers to offer education programs and materials, the Pinchot Institute also provides research and education on emerging conservation concerns and objective information to policymakers on key conservation issues. The Pinchot Institute conducts this work at Grey Towers and at the Resources and Conservation Center in Washington, DC, in partnership with the Forest Service and in collaboration with universities, natural resource agencies, and conservation organizations across the country and around the world. Dr. Gifford Bryce Pinchot, son of the famed forester, addresses the crowd at the Pinchot Institute dedication ceremony. Conservation and environmental sustainability depend on sound environmental science, but also consider economic viability and social responsibility. These principles were part of Gifford Pinchot’s philosophy of “practical conservation” a century ago, and today they are recognized throughout the world as key to the successful conservation and sustainable management of natural resources, whether at the national scale or in local communities. The Pinchot Institute brings together people and organizations with a diversity of perspectives and expertise to work on conservation concerns, building mutual understanding and respect, and facilitating collaborative problem solving. The results of conservation studies are available through Pinchot Institute publications, on the web at www.pinchot.org, and through social media. Additionally, a documentary film called Seeking the Greatest Good (2013) explores the life and legacy of Gifford Pinchot and highlights three Pinchot Institute projects. 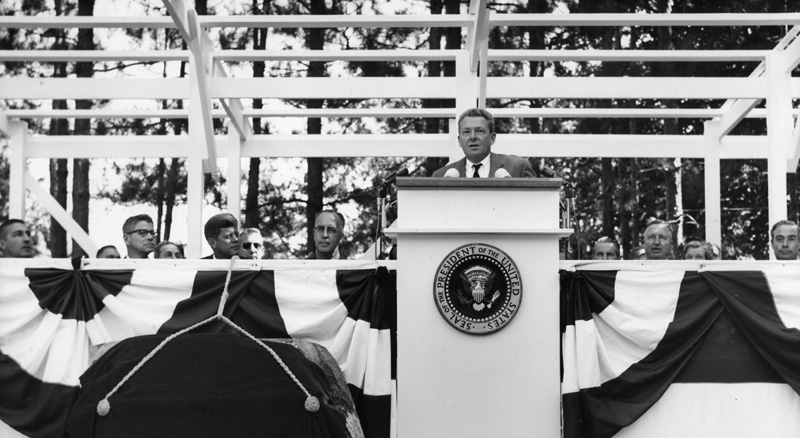 Browse historic images of the September 24, 1963, dedication event at Grey Towers in the Pinchot Institute Dedication photo gallery.